Sputnik spoke to George Szamuely, Senior Research Fellow at the Global Policy Institute. 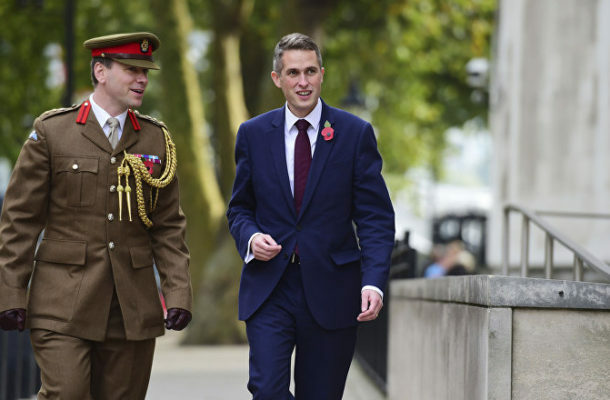 Sputnik: What do you make of Gavin Williamson’s comments that Britain should ‘increase its lethality’ — surely this rhetoric is more aggressive than defensive and potentially dangerous at a time when we have the US and Russia withdrawing from the INF nuclear arms reduction treaty? George Szamuely: Yes, absolutely, it’s extremely dangerous and extraordinarily reckless on the part of Williamson to be talking like this. This kind of talk is absolutely insane because if Williamson were to have its way, Britain would be finding itself in a shooting war against powers that are much stronger than Great Britain and it would lead to devastating consequences. Sputnik: Williamson also mentions in his speech that cost of non-interventions has often been “unacceptably high” and argue that Western powers cannot ignore those in need as “to talk but fail to act risks our nation being seen as little more than a paper tiger.” do you think we will see the UK engage in more military interventions as it tried to re-assert itself in the post-Brexit world? George Szamuely: Well, I think that’s quite likely; we’ve already seen this with Theresa May happily signing on to the missile attacks on Syria and she was also involved in the threats last year of extensive attacks on Syria should the Russians try to take Idlib. So I think that’s very likely. And the ridiculousness of Williamson’s assertions; when you think of what Britain has done just in the last two decades — the aggressive acts that it has engaged in, starting with Yugoslavia, Iraq, Libya, Syria – all of that Britain has been engaged in. Russia and China haven’t done anything!